Free Shipping Included! 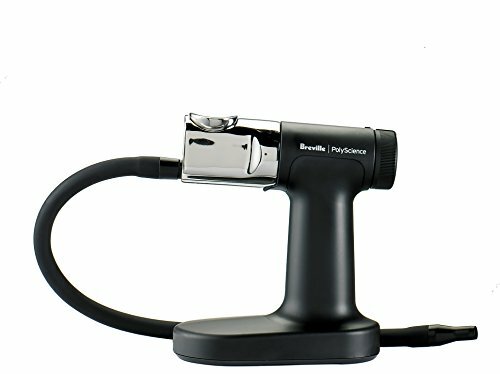 Save 1% on the Breville|PolyScience The Smoking Gun Pro Smoke Infuser, Commercial by PolyScience at Three Guys Pies. MPN: 608168-CSM700PSS0NUC1. Hurry! Limited time offer. Offer valid only while supplies last. PolyScience the smoking gun Pro food smoker for cold smoking meat, fish, vegetables, desserts, beverages and classic cocktails in just 5 minutes. PolyScience the smoking gun Pro food smoker for cold smoking meat, fish, vegetables, desserts, beverages and classic cocktails in just 5 minutes. Smaller and more versatile than a smoker grill, it's the perfect alternative to smoker accessories for adding big, smoky flavor and aroma with very little effort. No soaking wood chips or cooking foods for hours for that smoky flavor. Cold smoking gently infuses a measured amount of natural cool smoke to enhance flavors without cooking or preserving foods, or changing textures or temperatures. With enhanced performance and greater longevity, the smoking gun pro's wider 1-inch 18/8 stainless steel burn chamber loads easier and holds more smoking materials. The easy-turn dial allows total control over airflow (from 5.3 to 15.1 meters per second) and smoke intensity. No electricity required, it's battery-operated for portable, versatile use anywhere, both indoors or outside. Compact and lightweight with integrated stand for comfortable, single-handed operation. The 17.5-Inch silicone nozzle extender hose places smoke with precision. Works with a variety of wood smoking chips, teas and spices, Hay, dried flowers, and herbs. Approved for commercial use, the cold smoker is perfect for professional and home chefs, as well as mixologists. Smoke Salmon after Plating, serve smoked cheese or butters, cherry tomatoes for salads, sauces, chocolate, meringues and fruits in a flash. Easily elevate bartender recipes to exciting smoky cocktails, like smoky Marini, smoky Mary and dragon's breath. Simply fill burn chamber, light the combustibles, and apply the smoke. Includes replacement smoke screens, wood chip sample pack (1/2-ounce each apple and Hickory flavors), 4-aa batteries, complete instructions, and 1-year manufacturer's warranty. Compact for easy storage and transport anywhere. Disassembles easily without tools. Wipe clean with a damp cloth. Detachable burn chamber and smoking barrel are dishwasher safe for easy cleanup. If you have any questions about this product by PolyScience, contact us by completing and submitting the form below. If you are looking for a specif part number, please include it with your message.